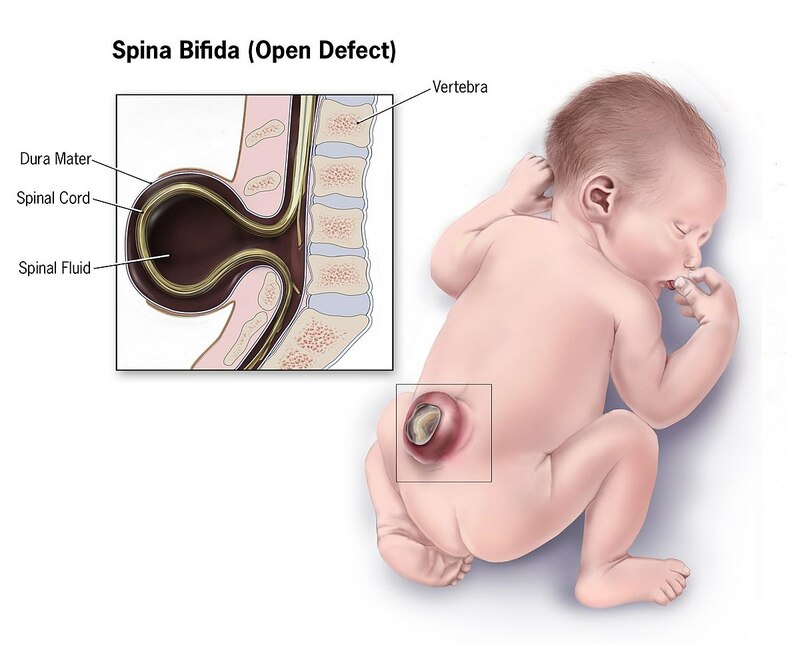 The Spina Bifida means a congenital malformation (visible at birth) which is characterized by poor development of the spine . This abnormality causes paralysis and other complications such as loss of leg sensitivity and urinary disorders . There are several types of spina bifida and their origin is unknown. The folic acid helps women of childbearing age to reduce the risk of spina bifida. The term spina-bifida means in Latin “spine split in two”. This congenital disease results in the absence of posterior closure of the spine, where the spinal cord is located . The muscles, bones, nerves and skin of the fetus around the opening cannot develop properly. This crack promotes the formation of a celerum , a kind of pocket on the back of the fetus. The complications that spina bifida causes depend largely on the location of the celeriac and the contained elements. The origin of spina bifida is not known with certainty. Several risk factors are often put forward, including the genetic factor , the mother’s diet and the environment in which the fetus develops. Nevertheless, the disease seems to result from the combination of several factors, some of which have not yet been identified. Spina bifida occulta: This is the least severe and most common form of spina bifida. The spinal canal is not completely closed. Generally asymptomatic, it does not require any special treatment. Spina-bifida myelomeningocele: This is the most serious form of Spina Bifida. Nerves and spinal cord are deformed. In some cases, the meninges (envelopes that surround the brain and spinal cord) have a slight opening, leaving the spinal cord uncovered. Spina bifida meningocele: The least common form of spina bifida. The meninges, without nerves or spinal cord, are partially expelled from the opening created in the upper part of some vertebrae, causing mild or moderate disorders. Spina-bifida occulta: repetitive meningitis , motor disorders, slight loss of sensitivity, urinary incontinence (involuntary urine loss), colon disorders. Spina-bifida myelomeningocele: more or less severe paralysis, great loss of sensitivity in the legs, urinary and urinary incontinence, hydrocephalus (increased volume of spaces that contain cerebrospinal fluid), lumbar vertebrae involvement, motor and psychic disorders , deformity of the feet and / or legs, bedsores. Spina bifida meningocele: slight or similar disorders as spina bifida occulta. Clinical observation and medical imaging ( x-rays or prenatal ultrasounds ) allow the doctor to diagnose and confirm the type of spina bifida. The surgery is considered if myelomeningocele spina bifida to avoid further damage and infection. Spina-bifida myelomeningocele is very often accompanied by hydrocephalus (in 80% of cases). A ventriculoperitoneal bypass must be installed to release the accumulated fluid. Patients with spina bifida should be closely followed throughout their lives. How to prevent spina bifida? A follow-up ultrasound in pregnancy can help detect early the presence of spina bifida. If this malformation is detected, antenatal surgery or even therapeutic interruption of pregnancy in some cases will be proposed. The consumption of folic acid significantly reduces the risk of spina bifida. A dose of 0.4 mg of folic acid is recommended daily during the month before pregnancy and during the first trimester. Folic acid is mostly found in wholegrain bread, fruits, green vegetables and meat .